FORCE-CAM is a diverse organization with expertise in many fields, giving us the ability to assist communities in a variety of developmental areas. We assisted the community of Njipntoh-Ndu, Donga Mantung Division of the North West Region of Cameroon to rehabilitate the dilapidated and non-functioning gravity-flow water system affecting between 2,300 to 2,600 people. It was through part community contribution and involvement that the water system was rehabilitated and once again active, impacting in large part, women and children who act as water carriers. 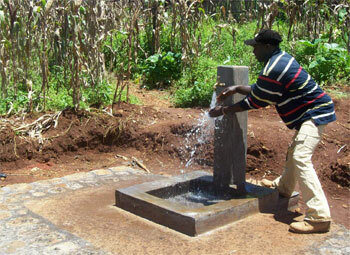 Due to lack of potable water, carriers walk more than 1 mile each day to fetch potable water for their families. Rehabilitation of phase one of the water system has a large socio-economic impact for the affected community. Phase 2 extended the water system to three other villages, carried Replica Jaeger-LeCoultre Atelier Reverso Arrives out water point protection and constructed a water filteration tank for one of the water sources which we tested and found it contaminated. FOUNDATION for Resources and Community Empowerment OF CAMEROON (FORCE-CAM) is an apolitical, non-profit making Charity organisation registeration No. 034/E.29/1111/VOL8/APPB of 29 May 2006 and governed by Law N° 90/053 of 19 December 1990. It has its head office in Bamenda and operational offices in Ndu, Donga Mantung Division and Yaoundé. FORCE-CAM, also called YUNIWO FOUNDATION was founded by Pa David Yuniwo Nfor. Born a Prince of the Palace of Ndu in 1933, Pa soon became an orphan barely two years after when his father H.R.H Fon NFOR died in 1935. This was followed shortly with the death of Cheap NFL jeserys for sale.This is best cheap NFL jerseys store online. his mother Wintoh Bonyah when he was 12 years old. Pa David NFOR grew up as an orphan living the daily challenges that go along with. It was from a background of someone who understood the mind of an orphan and the challenges an orphan goes through that Pa Yuniwo developed the guts of taking care and improving upon the wellbeing of Orphans and the less privilege in his community. In the course of time, his charity activities eventually gave birth to an organization known as FORCE-CAM (YUNIWO FOUNDATION) which coordinates orphans support activities that he had been doing decades before. At his death on the 5th of December 2007 at the age of 74, he lived a continuous life of thankfulness to those God had blessed with sound advice, who advised him when he was at crossroads; those God had blessed with good homes who gave him shelter when he had nowhere to stay; those God had blessed with encouraging spirit who encouraged him when he was losing hope; and those God had blessed with money who paid his fees when he needed enrolment into school. These were the ideals that motivated FORCE-CAM’s activities.